eShakti is a women’s fashion brand that is well known for their variety of dress styles, which come in a variety of prints and colors. eShakti also specializes in mass-customization on designer clothes for women: they create the designs and you customize. At the USA eShakti online store, you can also shop for dresses for special occasions, such as a wedding -- they have a variety of options, whether you are the bride or a bridesmaid. With Big Apple Buddy’s personal shopping service, you can now buy direct from the USA eShakti online store anytime, anywhere. At eShakti, you can find a dress for any occasion - whether you’re looking for a bold pattern or something more simple and timeless. 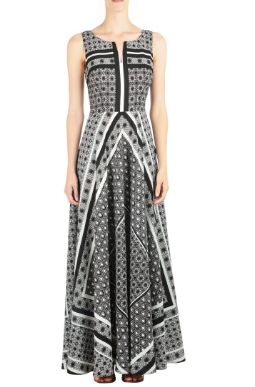 The Graphic Scarf Print Crepe Maxi Dress has a bold black and white print that will immediately make a statement once you put it on. This flowy A-line maxi dress features a split-scoop neckline and a figure-flattering seamed waist that makes it comfortable to wear all day long. With two side seam pockets, you can also easily store small items like a cell phone or your wallet, so you don’t have to carry a purse when wearing this dress. If you’re looking for a fun, bold dress to wear during the warmer months that will stick out from all the other dresses in your closet, then this one is for you! 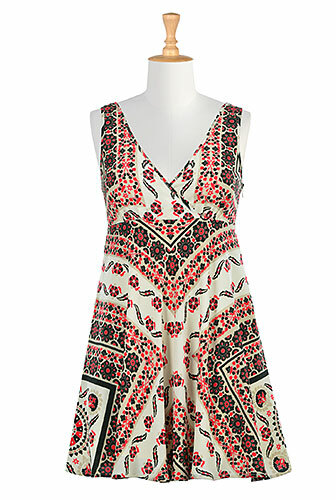 The Scarf Print Crepe Empire Dress is another example of the bold and exciting prints that you can shop from at eShakti. This dress is cut at a short length with a flirty V-neck and flattering Empire waist. With the right shoes and accessories, this dress could be perfect for a special or more formal occasion but can also be worn in a more casual, everyday manner. It’s loose and flowy, so you’ll be comfortable moving around in it all day long! And the bright colors in this dress will help you make a serious fashion statement - the cream, beige, black, and red are a great alternative to the everyday black or white dress. 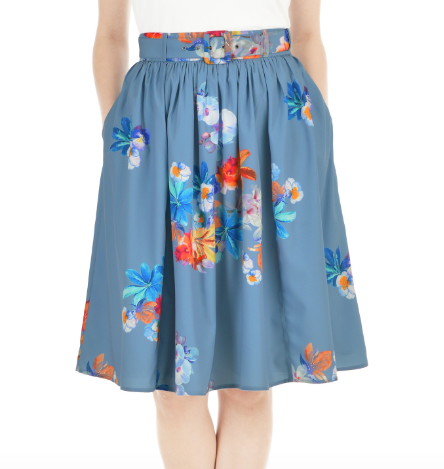 There are also a variety of top and skirt options to shop from at eShakti. The Painted Floral Print Belted Crepe Skirt is a feminine fifties inspired skirt styled with ruched pleats for a full flare. This is a perfect option to wear to the office or for a day out shopping: the bright floral pattern will immediately add some flair to any outfit. This dress is flowy, so it’s perfectly comfortable, whether you’re sitting in an office working or walking around shopping. Add this skirt to your closet to immediately bring some color and fun patterns to your wardrobe! Unfortunately, the USA eShakti online store does not currently offer international shipping. However, Big Apple Buddy, your personal shopper, can help you buy products direct from the official USA eShakti online store and ship them to your doorstep, no matter where you are in the world. If you would like to buy from the USA eShakti online store, simply let us know which items you would like to order (by filling out the form below) and we’ll get back to you with a free international shipping quote within 24 hours!